Bobby Grich is one of the best players not in the Baseball Hall of Fame. 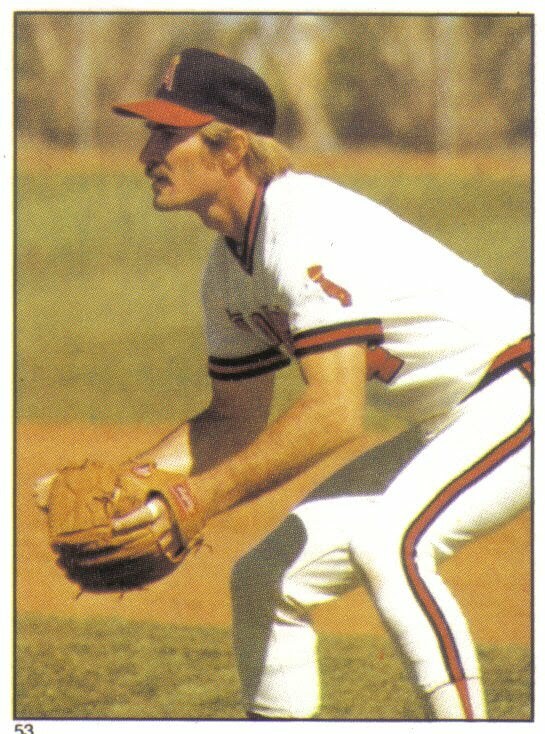 Grich played from 1970 to 1986, manning second base for the Baltimore Orioles and California Angels. Grich sported a slick glove, keen batting eye, and better than average pop for a middle infielder. Grich made six All-Star games, won four Gold Gloves, and at the time of his retirement was one of just a handful of second basemen with over 200 career home runs. Yet, when he became eligible for the Hall of Fame on the 1992 BBWAA ballot, Grich picked up only 2.6% of the vote--failing to collect the necessary five percent required to appear on future ballots. Unfortunately, Grich has the dubious honor of being arguably the best player to fail to make it past their first year on the BBWAA Hall of Fame ballot. As if that wasn't bad enough, Grich also had the misfortune of appearing on two of the most embarrassing baseball cards ever made. 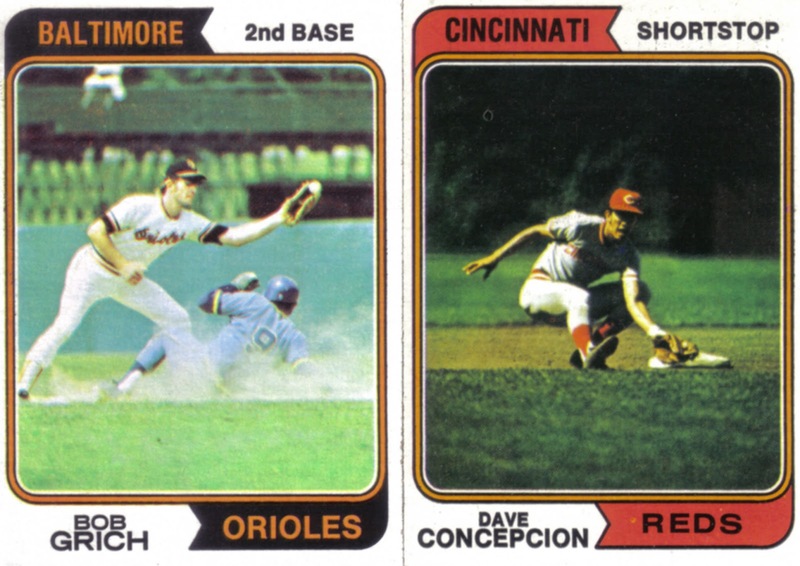 Donruss and Fleer burst onto the baseball card scene in 1981 shaking up the baseball card industry which up until that point had been monopolized by Topps. For their first three years, Donruss produced plain, relatively cheap looking cards with white bordered designs that changed little from year to year. Though for 1984 and 1985, Donruss steered away from its boring white border design to produce some radically different, much more exciting cards. 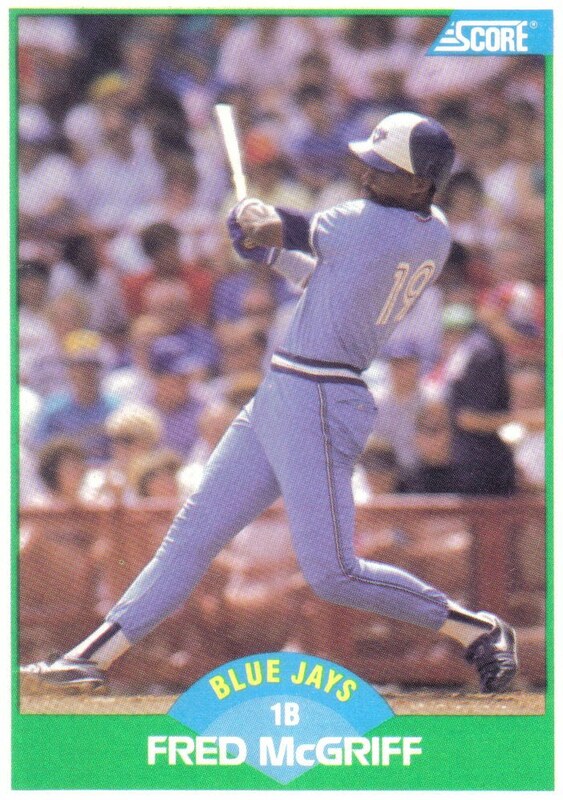 However with their 1986 series, Donruss took a noticeable step backward opting for a bland design featuring light and dark horizontal blue lines. 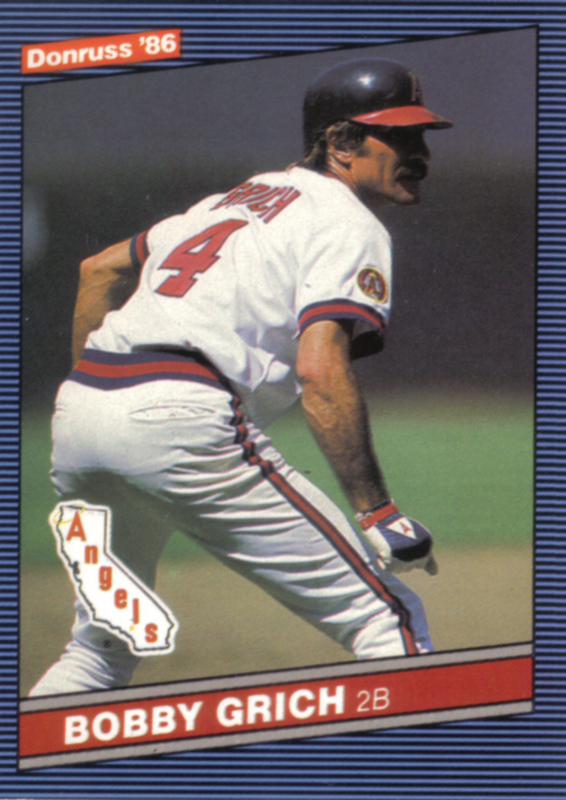 One of the worst cards of the '86 set is Grich's card in which the placement of the Angels logo is almost as insulting as the 2.6% of the vote he received in his lone appearance on the BBWAA ballot. Had Donruss just centered the card slightly different then it wouldn't look as if Grich is crapping out the state of California. (It's a wonder Grich was able to leg out three triples in 1985--I'm sure it wasn't easy to run with the Golden State clogging up his large intestine). 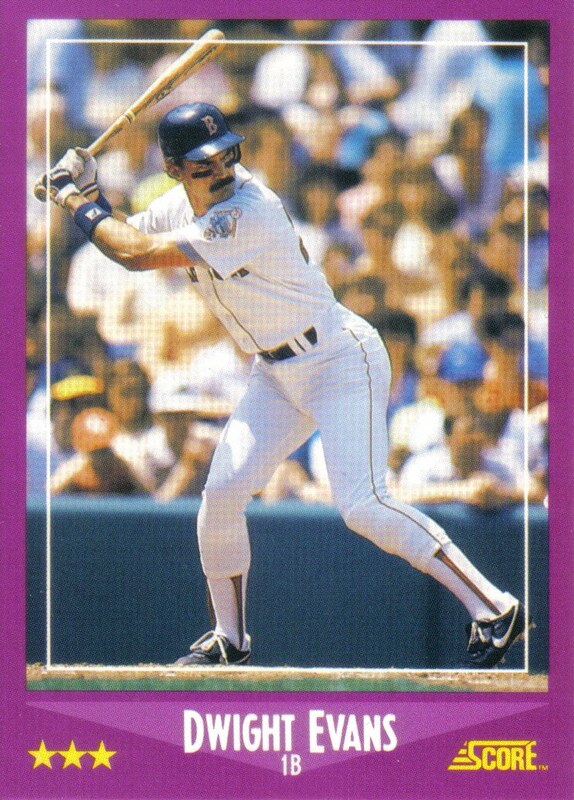 Aside from the shameful layout of the card, Grich's '86 Donruss does showcase one of his key strengths: his ability to get on base. Grich was a patient hitter who often finished among the AL leaders in walks and OBP--two stats that were largely overlooked during the era he played in. In fact, Grich's superb walk totals didn't even make their way onto the back of one of his cards until Topps and Fleer finally decided to include them on their 1981 sets (Donruss would follow suit one year later). Moreover, no card manufacturer included OBP on the back of their cards until several years after Grich had retired. However, Grich's sole year on the BBWAA ballot was 1992 and it would be close to another decade before OBP would start to emerge from the shadow of batting average. There is little doubt that Grich's adequate but unspectacular .266 career batting average played a large part in his inability to gain enough votes to remain on the ballot. Had voters paid more attention to Grich's excellent .371 career OBP, which more than offset his batting average, the keen eyed second baseman likely would have been a much more serious Hall of Fame candidate. Good action shots are hard to come by on baseball cards, as most photos are posed shots with a player holding their bat or glove on the field or in front of the dugout or bleachers. However for Grich's '84 Fleer card, the photographer has captured a Seattle Mariner base runner sliding headfirst into second where Grich is manning his keystone position. 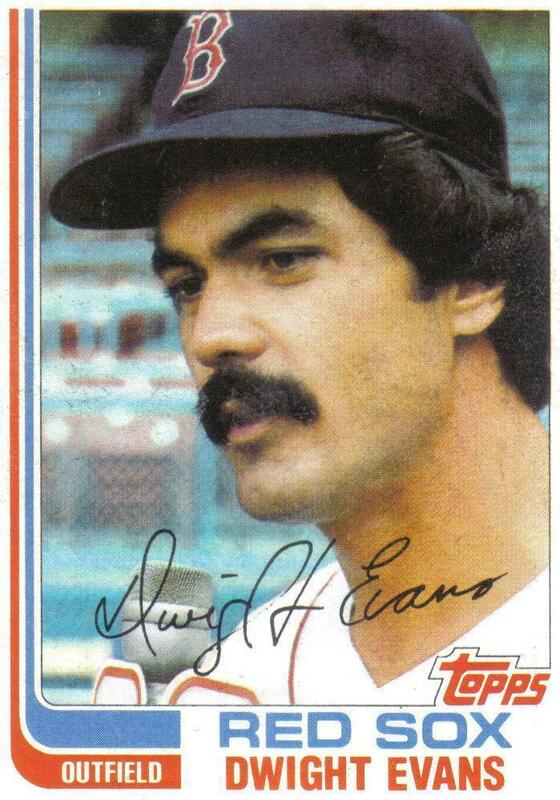 Though due to the nearly obscene tear in Grich's pants, his '84 Fleer card is more comedic than exciting. And, while it's great that Fleer was able to showcase the fielding aspect of Grich's game on this card, it's pretty ridiculous that they opted to go with this absurd shot of Grich. 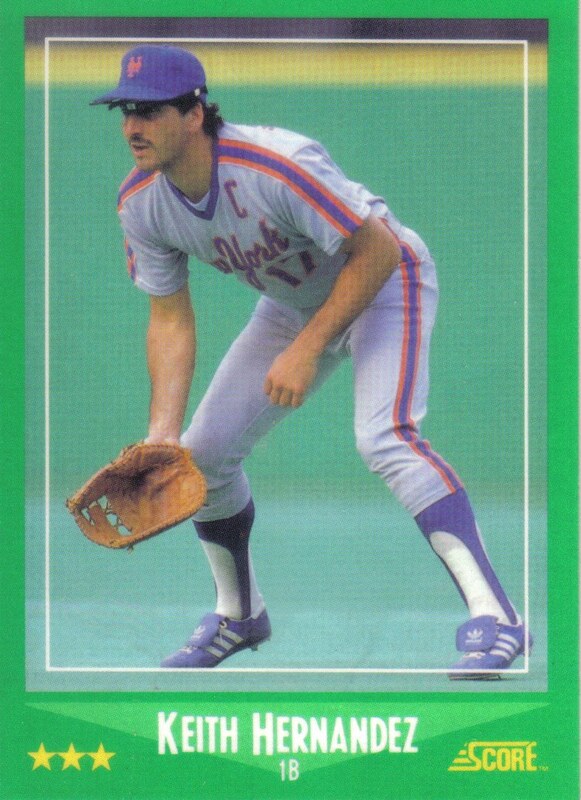 While his '84 Fleer card may be amusing, Grich was an excellent fielder and had a reputation as a hard nosed player who wasn't afraid to get his jersey dirty. Grich won four Gold Gloves and on at least two or more occasions, led AL second basemen in total zone runs, putouts, assists, fielding percentage, double plays turned, and range factor. However, Grich's stellar defense was only half of the story as he consistently put up well-above average offensive numbers for a second baseman. In fact, when Grich retired he only trailed Hall of Famers Rogers Hornsby, Bobby Doerr, and eventual Hall of Famers Joe Morgan and Joe Gordon in career home runs by a second baseman. 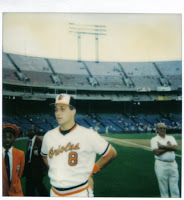 Moreover, during the strike-shortened '81 season, Grich became the first second baseman since Hornsby in 1925, to lead his respective league in home runs. 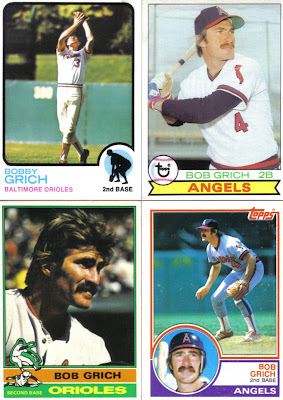 While Donruss and Fleer laid him low with their respective '86 and '84 offerings, by contrast the worst thing Topps ever did to Grich was refer to him as "Bob Grich" rather than Bobby Grich on most of their cards. 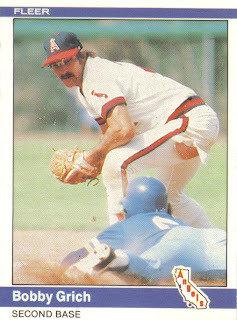 Topps always seemed to showcase the three most memorable things about Grich: his respected glove, his underrated bat and of course, his famous mustache. During Grich's career well-groomed mustaches were very much the style and Hall of Fame peers such as Rollie Fingers, Mike Schmidt, and Goose Gossage sometimes seem like they are remembered as much for their celebrated facial hair as they are for their career exploits. If Grich ever has any chance of joining these mustached Hall of Famers in Cooperstown, his only current means of getting there would be gaining election through the Expansion Era Committee. Under current Hall of Fame voting rules, the Expansion Era Committee meets once every three years to vote on retired players who are no longer eligible for election by the BBWAA, have been retired 21 or more seasons, and made their biggest contributions to the sport after 1972. In addition to the retired players, retired managers, umpires, and executives from the post-1972 era are also eligible to appear on the Expansion Era ballot. However, to even make it onto the Expansion Era ballot, a candidate must first be selected by the Historical Overview Committee which reviews the eligible candidates and narrows the candidates down to a final 12-man ballot. During Grich's career the traditional Triple Crown line of batting average, home runs, and RBI were the three main ways a player's career was evaluated. And, while his 224 career home runs were excellent for a second baseman, his .266 batting average and 864 RBI just did not stand out to BBWAA Hall of Fame voters back in 1992. However, since that time sabermetric stats such as OBP, OPS+, and WAR have come to be viewed alongside the traditional Triple Crown stats. While it is true that Grich's Triple Crown line could be easy for a Hall of Fame voter to overlook, the combination of his excellent .371 OBP, impressive 125 OPS+, and eye-popping 71.0 WAR should make any Hall of Fame voter think twice before passing over the scrappy second baseman. Yet, when the Historical Overview Committee selected the 2010 Expansion Era ballot they did just that. The Committee's failure to choose Grich was disappointing since he is one player whose stats on the back of his baseball cards never did his career justice and whose overlooked Hall of Fame candidacy seemed poised to benefit from the emergence of sabermetrics. Curiously, it would appear that sabermetrics played little of a role in the Committee's choices as the five former hitters selected by the Committee--Dave Concepcion, Ted Simmons, Steve Garvey, Rusty Staub, and Al Oliver--each had Hall of Fame cases that were largely weakened by sabermetrics. Moreover, when you look past traditional stats and use sabermetric stats to compare Grich's career to those five hitters, he holds a significant edge in several categories including OBP, OPS+, and WAR. Of those five hitters who appeared on the Expansion Era ballot, Dave Concepcion came the closest to gaining the 75% required for election on the Expansion Era ballot, picking up 50% of the vote. Unlike Grich, Concepcion made it past his initial appearance on the BBWAA ballot--albeit just barely with 6.8%--and was able to stay on the ballot for the full 15 eligible years, usually drawing around 11 or 12%, while gaining as much as 16.9% support. Had Grich made it past his first ballot, it is possible he could have remained on the ballot like Concepcion and probably would have been considered a stronger candidate by the Historical Overview Committee as a result. Concepcion played a little longer than Grich and was able to retire with over 2,000 career hits, something Grich was not able to do. Concepcion's ability to reach the 2,000 hit milestone likely played a large role in helping him pick up enough votes to stay on the ballot. In addition, Concepcion's reputation benefited from several factors that worked in his favor while Grich had many of those same factors work against him: Concepcion played his whole career for one franchise, the Cincinnati Reds, and was a member of two World Series winners during the team's celebrated "Big Red Machine" days. 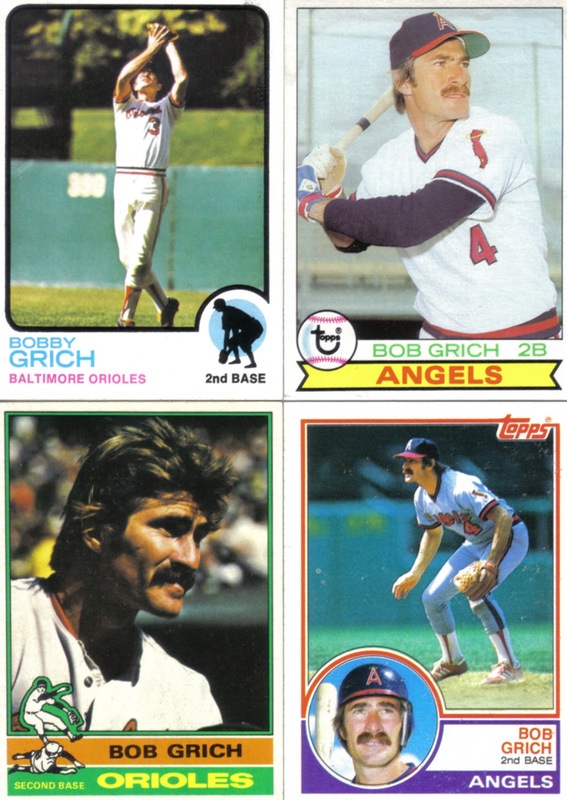 By contrast, Grich played for some competitive Orioles and the Angels teams and, while he was an important part of five division winners, he never made it to the Fall Classic. 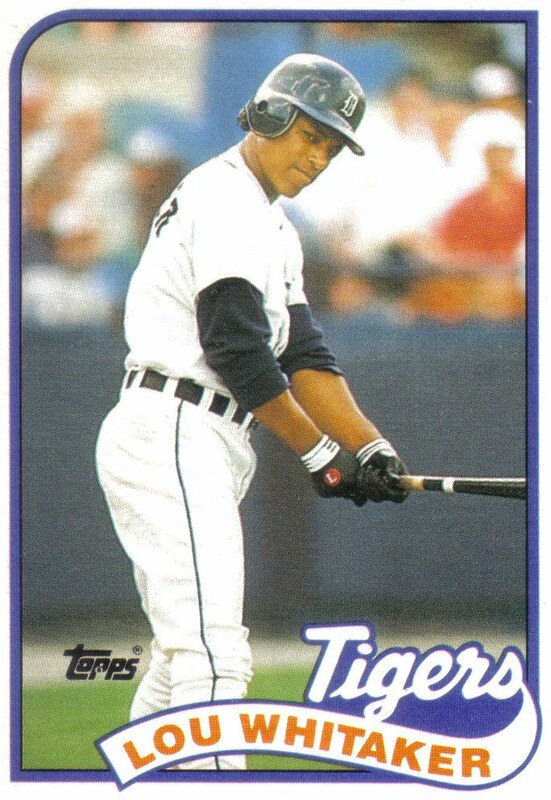 Likely aided by playing for a more visible team, Concepcion also received more recognition during his career than Grich, winning five Gold Glove Awards to Grich's four and picking up nine All-Star selections to Grich's six. Concepcion played his career at shortstop, arguably the most difficult and respected position, while Grich plied his trade at second, a physically demanding position but possibly the most underrated one. Their home ballparks played a role in making their offensive stats look closer than they were as Concepcion played his home games at hitter-friendly Riverfront Stadium, while Grich had the misfortune of playing his home games at the less offense-friendly Anaheim Stadium and Memorial Stadium, a notorious pitcher's park. If a Hall of Fame voter were to rely solely on traditional statistics, one could argue that Concepcion and Grich were comparable, however viewing their careers sabermetrically, Grich is noticeably stronger than Concepcion in every way. Grich's OBP-OPS+-WAR line of .371-125-71.0 dwarfs Concepcion's line of .322-88-40.0. In addition, Concepcion's best season OPS+ wise--116 in the strike shortened '81 campaign--is actually lower than Grich's career average OPS+ of 125. Also, Grich's worst full season of OPS+--98 in '78 (his only full season below 100)--is actually higher than Concepcion's career average OPS+ of 88. And, while Concepcion may have picked up five Gold Gloves to Grich's four, by total zone runs Grich edges his NL counterpart 82 to 52 as well. Moreover in Wins Above Average, Grich's career total of 43.5 is more than five times greater than Concepcion's career WAA mark of 8.3. Since Grich fell off the BBWAA ballot after the 1992 election the number of second basemen in Cooperstown has grown by a third. The BBWAA elected Ryne Sandberg and Roberto Alomar, while the various incarnations of the Veterans Committee added Nellie Fox, Bid McPhee, Bill Mazeroski, and Joe Gordon. Yet, none of those enshrined keystoners can match Grich's career 71.0 WAR, 43.5 WAA, or his 125 OPS+ and only Alomar--who sailed into Cooperstown with 90% on his second ballot--has an OBP as high as Grich's .371 career mark. Grich's ridiculous '86 Donruss and '84 Fleer cards may have made you chuckle or roll your eyes but the lack of respect he has been shown by the Hall of Fame electorate should make you shake your head.